To prevent dental caries, also known as cavities, children 12 months and older should see their dentist twice a year, brush their teeth twice a day and avoid, or eat in moderation, foods that can damage teeth. When children do not brush regularly, oral bacteria begin to convert food and drink remnants into acidic plaque that dissolves the tooth’s outer surface. Over time, this breakdown results in cavities — permanent damage to the surface of your child’s teeth in the form of tiny holes. “Cavities can affect children very early in life, and although they are totally preventable, they remain the most common chronic disease in children,” says Daniela Silva, DDS, MS, associate clinical professor of pediatric dentistry and director of UCLA’s Pediatric Dentistry Residency Program. Ensuring your child’s oral health should begin during pregnancy. Women who eat foods rich in calcium, vitamins C and D, and phosphorous help their babies to develop stronger, healthier teeth. Tooth decay in children can be prevented or reversed with proper daily oral care and a diet that refrains from frequent consumption of carbohydrate-rich foods and sugary drinks, which fuel oral bacteria’s harmful acid-production process. “It is extremely important that parents and caregivers control how much of these foods and drinks their children consume,” Dr. Silva advises. “If they are eaten, they should be consumed as part of a daily meal and not as a snack.” When eaten with healthier foods, the erosive effects of sugar and carbohydrates can be slightly offset. Fiber-rich fruits and vegetables such as carrots and celery stimulate saliva production and neutralize the acids damaging their teeth. Brush twice a day with fluoride toothpaste for two minutes and floss daily. For children younger than 3 years, use rice-size amount of toothpaste. Avoid prolonged thumb-sucking or pacifiers, which can reshape the oral palate and cause speech and swallowing impediments. Do not allow infants to go to bed with a bottle/food. 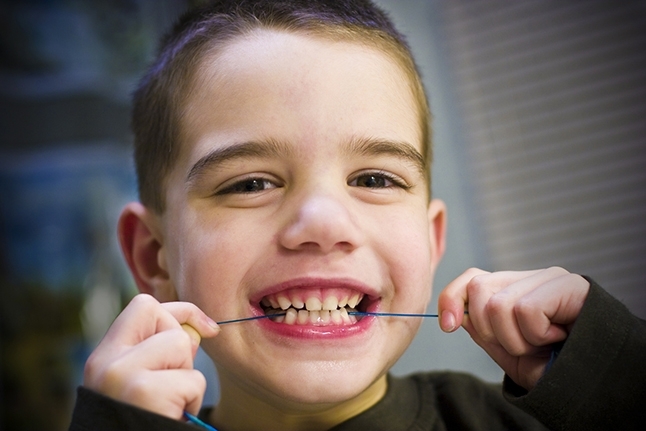 All children’s oral hygiene should be supervised by an adult. Turn an everyday chore into “family brushing time,” a dedicated time in the mornings and evenings that allows parents and young children to spend time together as they brush and floss. “Children have a tendency to imitate their parents and there is strong scientific evidence that shows a correlation between parents’ oral habits and their children’s,” says Dr. Silva.